I'm the white rabbit, drawing you closer to the rabbit hole. (SPOILERS) I never got around to reading The Secret Diary of Laura Palmer, as I think I rather unfairly dismissed it as little more than a cryptic cash-in. I also managed to wrong-foot myself with this latest secret edition, a precursor to forthcoming the third season, which I assumed would be something of a gap-filler for the intervening 25 years, rather than an exploration of the near-200 prior to the pilot. It has been suggested that the return of Twin Peaks will be tonally much closer to Fire Walk with Me than the oft-whimsical show itself. That may prove to be the case, but if so, it raises the question of how that will balance with this volume. 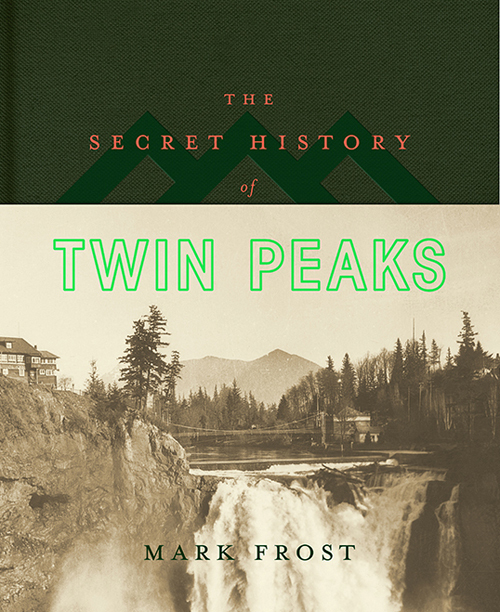 Because Fire Walk with Me was all David Lynch, whereas The Secret History of Twin Peaks is all Mark Frost. More than that, it has the kind of conspiratorial coherence – in terms of threading actual conspiracies rather than loosely threading together the essences of a vague idea - that one might have expected of The X-Files if it could have been bothered to plan anything out in advance, or behind. Or if it hadn’t been overseen by Chris Carter. And somehow, it all appears to make sense, almost as if Lynch and Frost always had this in mind, even though, as we know, the former’s whacked out on whackedness. I mean, since there was no mention of UFOs or Project Bluebook, or even a suggestion thereof, hitherto in Lynchdom, it was a fair bet that Major Briggs’ strange fascination was all Frost. And, while “The owls are not what they seem” is just the sort of thing Lynch would have dreamt up while drinking a hot cup of joe, connecting it to masonry is definitely Frost’s thing. And so, he joins an engrossing series of dots from the Lewis and Clark expedition (masons), to the various forms of the Illuminati, to taking in the disappearing giant skeletons in the Smithsonian (clearly designed to evoke Carel Struycken’s Giant), to all manner of E.T.s and including Roswell, White Sands, Area 51 (the alien focus not precluding their being interdimensional, which is much more Peaksy), L Ron Hubbard, Aleister Crowley (two lodges of black and white magicians), Timothy Leary, ayahuasca, Watergate (Nixon was onto those UFOs, and even had a Grey in his basement), Jack Parsons and the Babalon Working, Bohemian Grove, and suddenly the child abuse at the centre of Twin Peaks takes on a more overarching, ritualistic theme, bricks stacking around the netherworld invading one man’s psyche. What’s most impressive here is how fluid Frost’s refashioning is. Positing itself as written by Major Briggs (although the FBI annotator concludes it’s down to Coop at one point), The Secret History ends not long after the second season cliffhanger, so maintaining an air of suspense over what happened next, and offers very little insight into those we know from the show, such that it’s almost a sop that there are accounts of trouble at mill, Josie Packard, and Big Ed (the most we get of additional info is that Audrey survived the bank explosion, which killed Andrew and Pete, also that “bad” Coop paid a call on Briggs just before his journal ends, leaving the latter in an anxious state – as for the absence of Annie from Season Three, she ain’t here either, although Frost has apparently specified there are reasons for this). Rather, it takes one of the least interesting strands of the show, the feud between the Milford brothers, and weaves a whole backstory regarding Douglas Milford (Tony Jay) and his involvement in all manner of arcane activities, triggered, it seems, by an encounter in the woods (such an event also later marked the Log Lady). While Frost resists forming conclusions – that would be tantamount to revealing who killed Laura Palmer – he weaves such a compelling tapestry that, as stated, you’d almost believe they had all this in mind from the outset. It’s so tight that the frequently saggy interludes of Season Two are banished from the mind. Frost even makes time for Fire Walk with Me characters, from the disappeared agents Chester Desmond and Sam Stanley to Carl Rodd and, most enticingly, Phillip Jeffries. There are also some very funny bits, such as the mock-up of Dr Jacoby’s mind-expanding “The Eye of God: Sacred Psychology and the Aboriginal Mind” (so glad Russ Tamblyn is making a return). It’s quite possible, nay likely, that most of what’s on offer here will be entirely tangential to the dozen-and-a-half episodes arriving in a few months’ time, but it nevertheless provides a fascinating underpinning of all things Twin Peaks, one that expressly links the world of Lynch to the outside conspirasphere. Because, let’s face it, the Project Bluebook part of the original never exactly screamed for attention. Now, whatever connects the lodges in the woods to whatever’s out there in the universe appears to have been tagged as central. Oh, and leading us directly into the series, the annotations are made by Agent Tamara Preston, who will be played by Amy Shiels.